Growing gardens in containers is an increasingly popular way to adorn your outdoor space. Small-space dwellers have the option to create a garden on a patio, deck, or even a fire escape. Start the season off right by properly preparing your pots for the growing season. 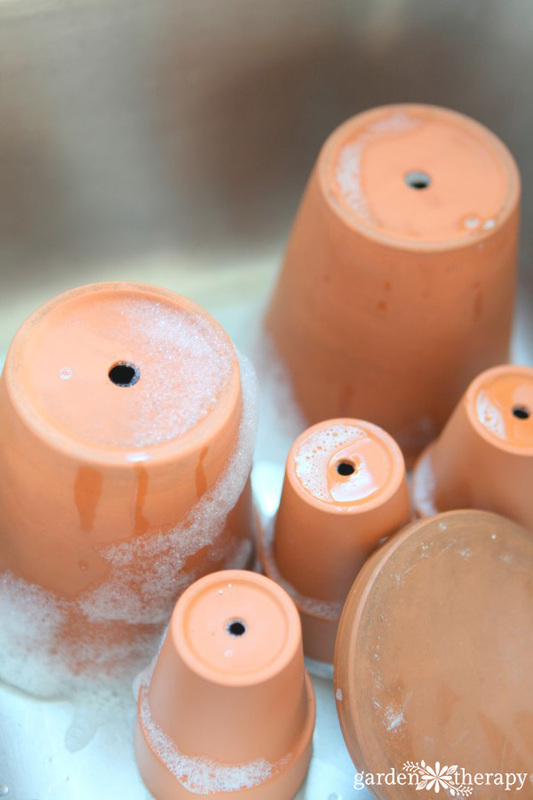 Whether they are terracotta, resin, glazed ceramic, or plastic, here are some pointers on how to clean garden pots. Don’t brush over this advice because you think they are just going to “get dirty” anyway. Here’s why: pots that are dirty often contain minerals, pests, bacteria, and fungus that can harm your plants before they even get a good start. Containers offer a unique set of circumstances to keeping plants healthy. They can be more vulnerable if the plants aren’t properly cared for because they won’t be able to draw off their natural environment for help. In other ways, they have an advantage because they will be planted in a favorable environment, with clean soil and no inherent pests or disease to contend with. That is, unless you plant them in pots harboring pests or disease. Clean garden pots mean a healthy start for your plants. What is the White Stuff on Terracotta Pots? Have you noticed a buildup of a white, powdery substance on your garden pots? This is very common and nothing to worry about. That white powder is a buildup of minerals and salts leftover from fertilizers and hard water. 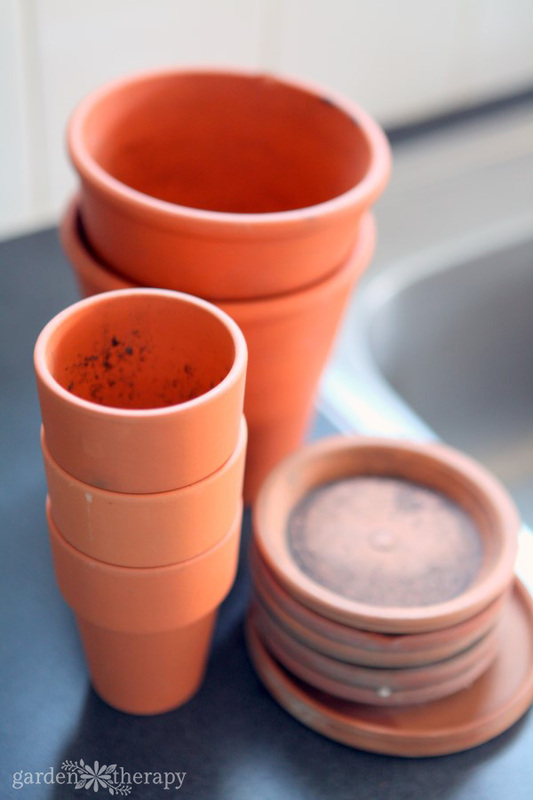 The buildup will not harm plants, but it can detract from the look of your pots. The best way to get rid of it is by brushing the pot with a stiff nylon brush. 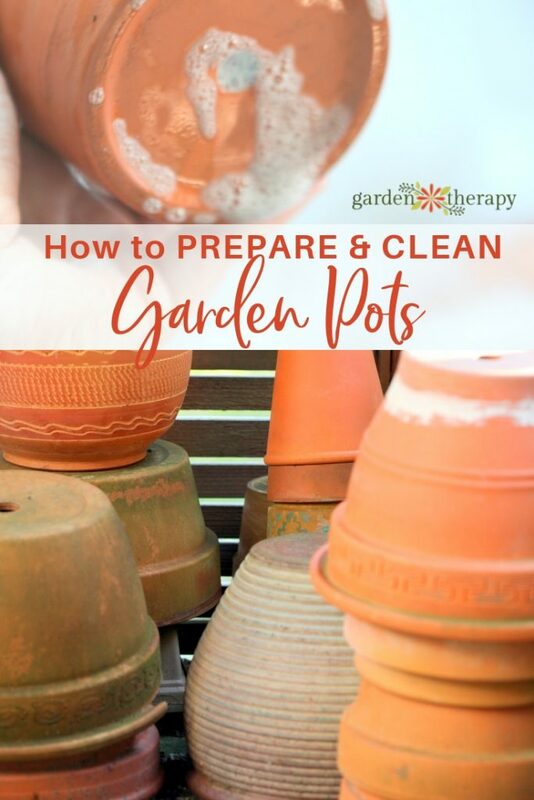 You will need to also wash your pots thoroughly, as brushing them may get rid of the mineral buildup but the pots could still contain traces of disease or pest eggs, so make sure to take the time to give your pots a good wash.
Use a stiff brush to remove all the dried soil and debris from both the inside and outside of the pot. 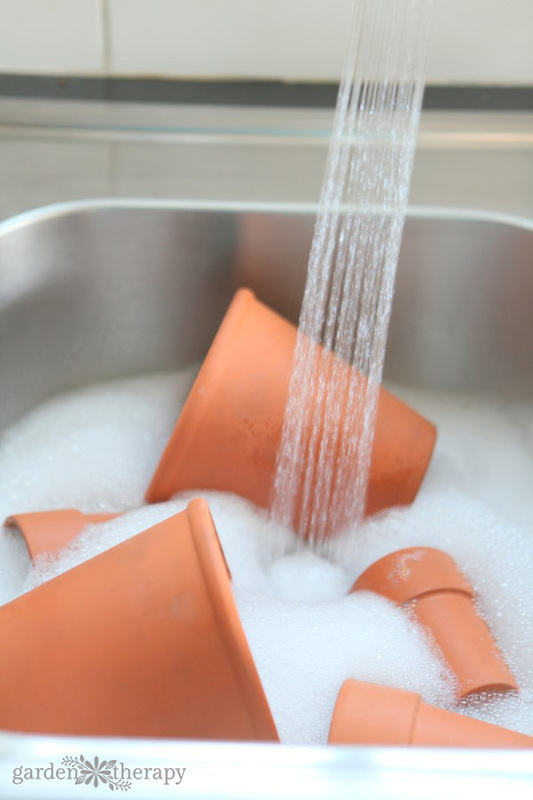 Fill a sink or large container with warm water and dish soap and add one cup of vinegar. Wash the pots as you would wash your dishes with a scrubby brush to thoroughly remove all the debris and staining. You can either do this step in the kitchen sink or out in the garden with a bucket and a hose. If you’re using the sink, please make sure to brush off all the debris so that it doesn’t go down the drain (I had to write this because of a previous river-stone-in-the-garbage-disposal incident that had Mr. Garden Therapy a wee bit frustrated with having a gardener in the kitchen!). 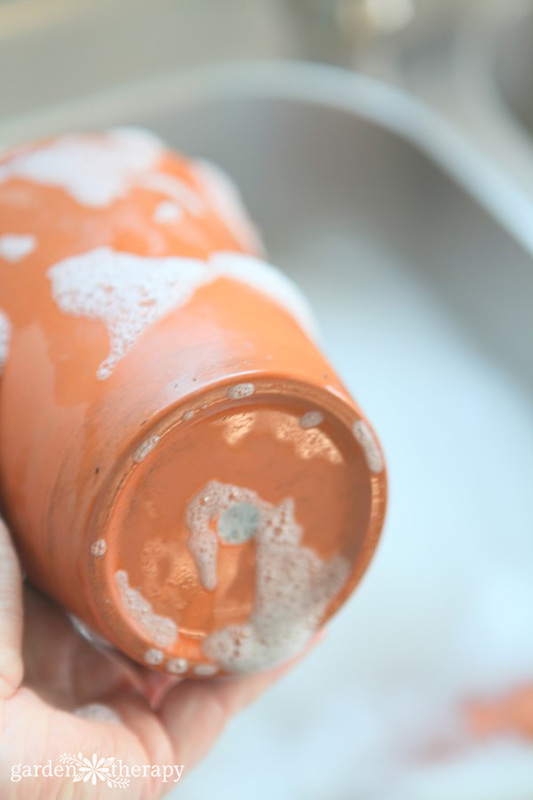 After your pots are clean, rinse them well and leave them in the sun to dry completely. They are now ready for planting! Great post here, Writer provide us great information here. Thanks for your helpful post. Never thought of the small in vinegar. Thank you. I have heard CLR. Works wonderfully. My concern is it good for planting in again. Will something lrach out and kill the plants. Please help? We use bleach and water. Let the pots soak, rinse and let dry in the sun. Any bleach left will volatilize off. The bleach will kill any plant pathogens on the pots.